SUNNY BRAE – A man’s final view in life last weekend was one of cows grazing under the stars while freeway traffic rushed past on the edge of Humboldt Bay. The man, identified as James Aloy Kummer, Jr., 56, of Arcata, died on the bench on Samoa Boulevard beteeen Union Street and Crescent Way. 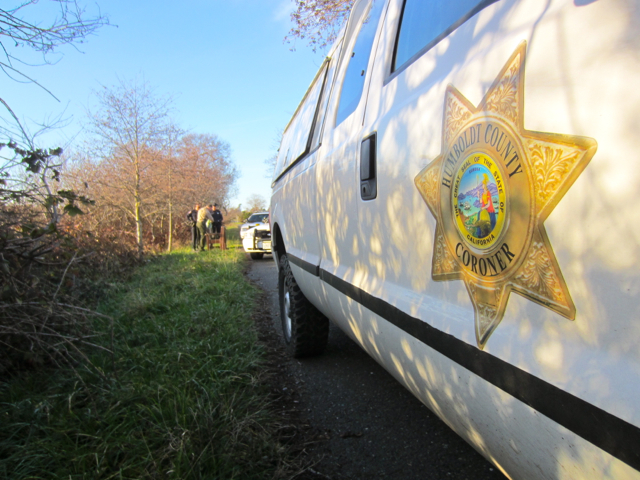 An autopsy conducted Tuesday indicated that the cause of death was heart attack, according to Humboldt County Coroner Dave Parris. He said hypothermia played a role in the cardiac arrest, and that alcohol was present. The temperature on the night prior to the body’s discovery was as low as 31 degrees. Kummer suffered from other medical conditions as well. Toxicology results won’t be available for a couple of weeks. At about 3 p.m. Saturday, police received a call about an unresponsive person on the bench. Arriving officers found Kummer tumbled down into the brush at the foot of the bench, beneath the level of the roadway. Parris said that the death may have occurred up to two days before the body was discovered. A man passing by with his child said he had walked past the bench earlier in the day and not noticed the body. Found at the scene were two types of alcohol – Tilt Red and some peppermint schnapps. Alcohol provides an illusion of warmth, but increases blood flow to the skin, radiating away body heat and causing core body temperature to drop quickly in cold conditions. Parris said that he “didn’t smell a lot” of alcohol during the autopsy. He said it was not possible to tell exactly what happened with regard to the various factors in Kummer’s death – for example, whether he passed out first, suffered hypothermia and then the heart attack, or some other sequence. Kummer was a resident of the nearby apartment complex at 115 Samoa Boulevard. Arcata Police had had multiple prior contacts with him, having found him passed out from alcohol “many times in the past,” Parris said, including on that same stretch of Samoa Boulevard, and on the same bench on which he passed away. This entry was posted on Wednesday, January 11th, 2012 at 3:31 pm	and is filed under News. You can follow any responses to this entry through the RSS 2.0 feed.